Easy-to-use - just snap in! 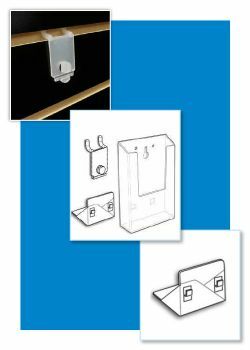 Need to mount your molded acrylic literature display holder to a wall or stand it up on a countertop, use our adapters to get the job done on pegbaord, slatwall or a table top! Clip Strip makes molded literature displays that help distribute printed materials to your audience wherever they may be. We even carry outdoor brochure holders that adhere to real estate for sale signs. Need PRINTING for what you place in these Literature Holders, ask Clip Strip Corp. to quote on your specifications. We have a full service POP Printing division to help meet your printing needs! 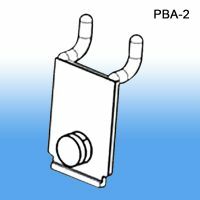 Minimum quantity for "Pegboard/Slatwall Wall Mount Literature Holder Adapter Clip, PBA-2" is 10. 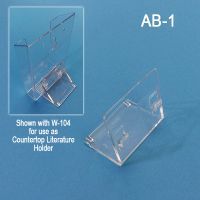 Minimum quantity for "Free Standing Counter Top Literature Holder Adapter Clip, AB-1" is 10.